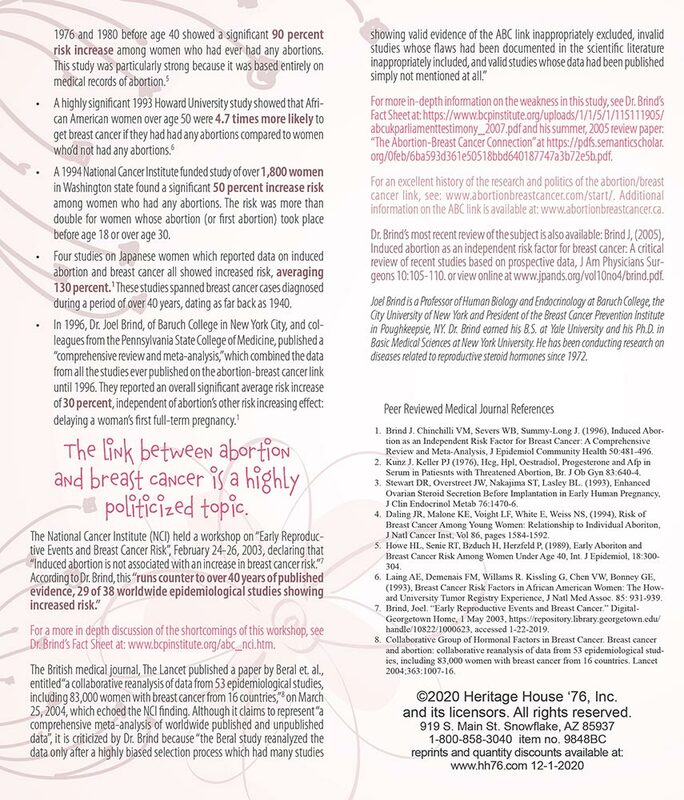 This pamphlet has a good overview of breast cancer risks and explains the link between abortion and increased breast cancer risk. This is helpful for all women to know about and makes it a worthwhile addition to packets for women at the abortion clinic. The discussion about the controversies over the studies is rather heavy going, though, and may be confusing to those who are unfamiliar with this type of information. I really like this as so many women have never heard that there is a correlation between abortion and breast cancer. It opens the door to think about the risks and evidence presented. This brochure has great and important information. I think it is a little overwhelming for a woman to read because it is so much information and so many words. Other than that I would recommend any woman facing this decision to read this information! This is a great tool in warning women of the risks of abortion and breast cancer...including every woman who is post abortive must be told. This viewpoint is so controversial and I'm really grateful to have the brochure to re-read and refer back to to stay informed. It's very helpful and full of information you can't readily find elsewhere.